We’ll be covering a few of the fitting solutions from The Anise Companion today. But first, take a look at the post on fitting. It goes over the techniques we’ll be using for slashing and pivoting the pattern in order to make adjustments. How do you know if you need a full bust adjustment? The most obvious sign is that it’s tight across the bust! If it’s tight elsewhere too, this indicates that you need to choose a larger size. However, if it fits perfectly well in the shoulders and the back but strains at the bust, causing stress wrinkles when the jacket is closed, try a full bust adjustment. Draw a pivot point on the underarm portion of the front armhole. Draw a line from here to the bust apex. Draw a line from the apex down through the waist seam. 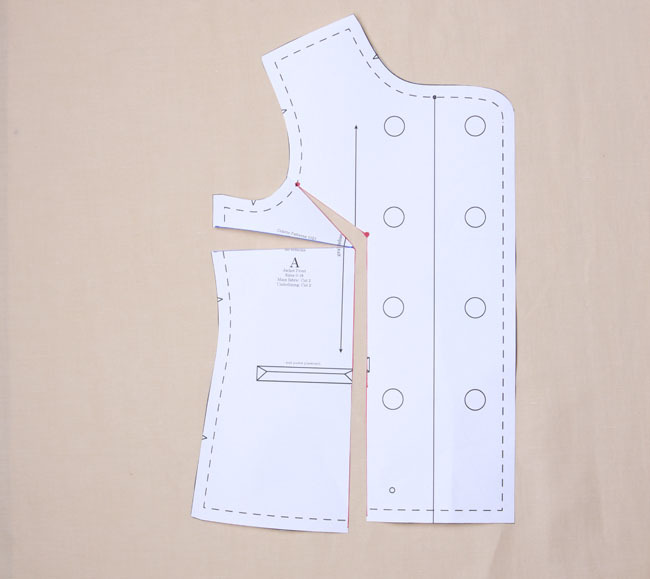 Draw a second line from the apex to the side seam. Slash from the waist, though the apex, and up to the armhole pivot point. Clip the seam allowance here. Slash from the side seam toward the apex, leaving a small hinge at the apex. Pivot all the pieces outward, adding the desired width at the bust and keeping the lower portion of the first slash line parallel. Slash from the first line toward the center front. Lower the center front to realign the waist seam. Lengthen the jacket back to match the jacket front at the side seams. Alternately, you can convert the extra length in the side seam to a bust dart. This will be more flattering on a full busted person, but be aware that this will change the style slightly, just because there will be a visible dart. If I were a larger cup size, I’d probably be ok with this myself, but it’s up to you. Adjust the front facing and lining pieces to match. Your adjustment is complete! 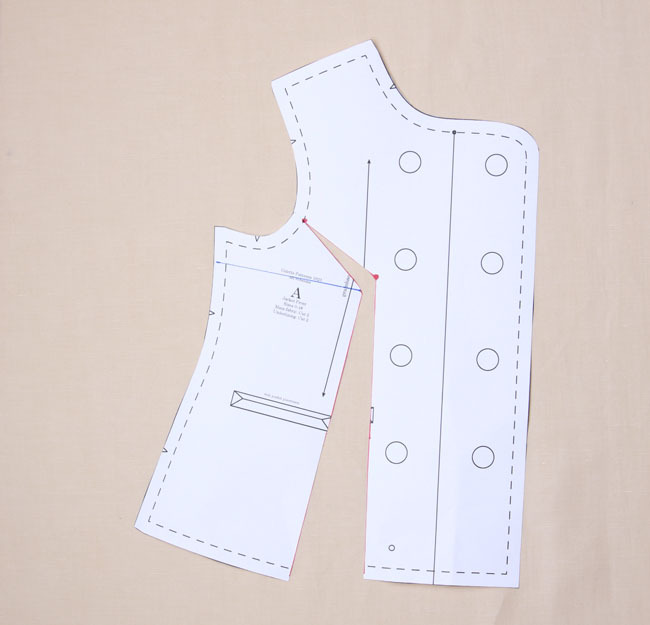 Get in-depth, step by step instructions for making the Anise jacket, with over 150 photos. Making a lined jacket is a fun and rewarding project. Get help along the way and learn some new techniques with The Anise Companion. I would love to see a great SBA tutorial. There aren’t many out there, and I find myself not making Colette patterns because the bust is always too big. I have trouble finding a solid SBA tutorial — one that isn’t just, “do the same thing as a FBA, but backwards,” so one here would be much appreciated! My book has a standard SBA in it, and there is one specifically for this pattern in The Anise Companion. Unfortunately, there’s no way to cover all the adjustments here on the blog. I appreciate you providing these tutorials but as a full-busted otherwise small person (28FF bra), I would never make the adjustment you describe. You are adding width through the whole length of the front from the bust point downwards. But I and many other full-busted women don’t need more width around the ribs and waistline. I need a jacket to fit my bust and my waist too. Then you are lengthening the back to make the side seams align – but the whole point is that my shoulder-to-waist measurement at the front is (quite a bit!) longer than my shoulder-to-waist length at the back, for obvious reasons. You have just made the whole jacket wider and longer! I much prefer to increase the size of an existing bust dart, in effect to increase the centre front length compared with the side seam; and add width at the bust point but then take it out again with darts or seaming below the bust down to the waist/hip. Personally I also need to lower the bust point to match my body and then take out some length between bust and waist. I have to admit that the resulting pattern pieces can look odd, and like they are exaggerated. But it works. I have to disagree here, Su. This is a swing jacket, not a fitted jacket. If you look at the pattern piece, there are no seams or darts for front shaping. It’s designed to have some subtle shaping at the side seams only, and pretty much hang straight from the bust. Adding a waist seam or dart (which I think is what you’re suggesting?) would dramatically alter the style lines. You’re talking about adjusting existing darts, but this design has none. If you read the end, I suggest that you do not need to lengthen the back if you add a side bust dart. This provides better bust shaping and minimally alters the jacket’s style, but I leave that as a matter of individual choice. As I said, I think it’s worth it. That’s a good point! I wouldn’t choose a swing jacket because fronts that hang from the bust just aren’t flattering for me. I was focusing on that and my need for waist shaping and not the overall look. I think the answer for me is : choose another style! Thanks for all your wonderful patterns and tutorials. I must agree, however, that Su is right. The full busted body needs extra length in the front to go over the bust and extra width across the bust. The back length should stay the same. The fullness added to the front at the waist is removed if needed, but taking in the waist dart, or princess seam, whichever you are working with. The dart added to the side seam in the front can be pivoted to another location, if desired, such as to the waist, or into a French dart coming from the side waist. Alice, I am not sure what waist darts and princess seams you are referring to. This is a swing jacket and there are none. See my comments to Su about lengthening the back. I showed it as an option, but point out that converting the length to a side dart is an option that I think provides better fitting, but slightly alters the style lines. But it’s what I would do. Agreed. Adding the bust dart would be the preferred adjustment for a full bust. And if anyone making this particular pattern wanted it to fit differently at the waist, it’s their choice, but it would definitely change the style line. I think my reference to the other darts was a more general option, rather than for this specific pattern. What about moving the bust point up or down? This is less of an issue here because there are no front darts. Usually that refers to altering darts or front seams. If it’s needed, you can add a little extra width at the side seam at your natural bust line. If you do an FBA, you’ll be drawing in your bust apex, so if you add a side dart, it will point to your apex already. After making the initial FBA, try on the pinned together pattern and find the optimal place for the BP. Then redraw the dart, remembering that the fuller the bust, the farther away from the BP the point of the dart needs to be. 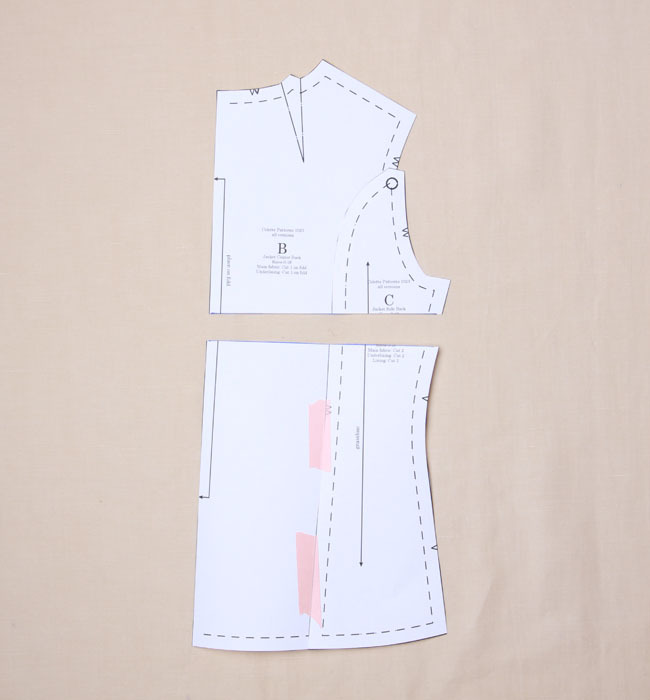 You can also cut out the dart, if using it, in a rectangle including the side seam, and lower it. Look at “Fit for Real People” by Palmer and Alto. More complicated fitting adjustments take more than one try-on. Keep at it until you get the best fit. I would like to know how you recommend choosing the correct size in Colette patterns. I know you draft for a C cup, which certainly makes sense, but I still can’t use a full bust measurement or I will end up with something several sizes too big everywhere else. Also, Colette seems to draft with less ease than the big4. Again, this makes sense, but I’m not sure where exactly to start. I would love to learn more about how Colette patterns are supposed to fit. Melanie, I think a lot of people struggle with this because bodies are so varied! Can you tell me specifically what you’d like to know? 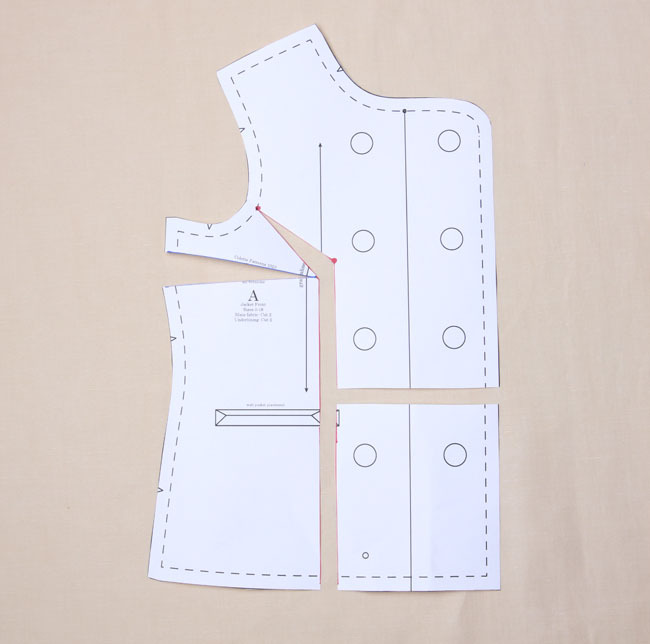 One thing to look at is the finished garment measurements, which include ease, so you’ll know exactly what the intended sizing is like, at least for the most important measurements for a given pattern. The body measurement chart lists measurements for each size. Would having an extended version with more measurements be helpful? Also, what other pieces will require the FBA to match? I’m guessing the lining front, for sure, but how about the front facing? You will need to adjust both the lining and the front facing, yes. That should be it! So, I’m a bit lost on how to translate the FBA to both the front facing and the lining. For the facing, all I need to do is just lengthen it, right? And for the lining, should I just tape the pattern piece over the front piece and just do the same exact adjustments or how do I do this? Thanks. Thanks Hannah for asking this, it’s the exact same thing I’m struggling with right now! I found that the lining and facing unit is drafted a little bit different from the shell. Now I can’t align the pieces exactly to transfer the changes, or am I wrong? I am in a similar situation to melani – i sew lots of your patterns for myself and my 2 daughters, and all of us reuqire an FBA, although all of us are quite different shapes,. My problem is working out which size to adjust. (I know extensive muslining would work – but you can’t make 2 or 3 muslins if you are making a dress for 3 different people – you would go mad! )The more information you can give here, the better. Currently I know you draft for a C cup, so I take 3″ off the stated bust measurement of a Colette pattern, and use that as the high bust, and work from there (ie. add another inch for me, 2″ for Miss DD and 3″ for Miss E ). The two extra measurments that would really help (especially on the more fitted styles) would be shoulder width and high bust. Bust to waist height would be terrific too. Perhaps a chart on your website would be a way of posting this information, if you don’t want to “overcrowd” your pattern envolopes. (There is a great one on “In-house Patterns” site). A tutorial on how to deepen a dart would be great too – I sort of know, but I find your tutorials so clear, that I always learn from them. I should say that my comment re SBA is in regard to sewing dresses. I’ve having no joy with the Peony at the moment. On a positive note, I’ve booked a sewing class to get some help. 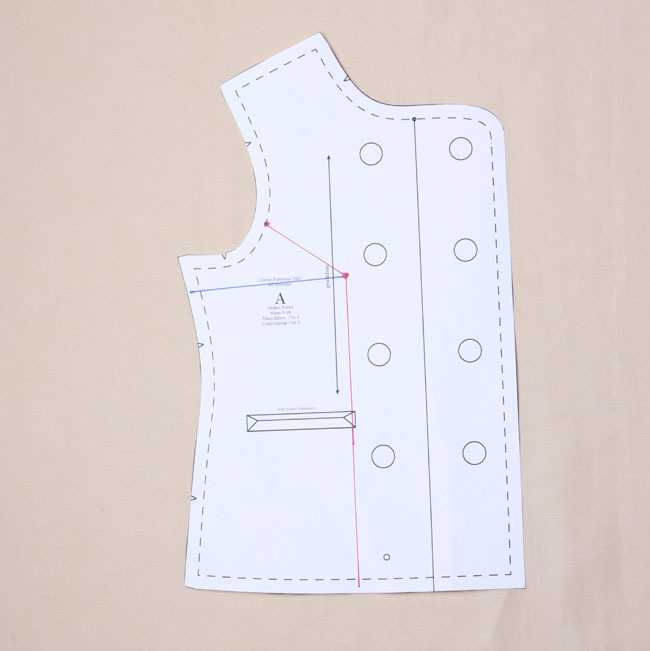 I love the Anise jacket, but first need to solve my sewing woes before attempting it. So fingers crossed…. In the UK there’s a shop (and online presence) specialising in large busted women. They do bras up to L cup, and dresses etc in four sizes: curvy, really curvy, super curvy and super duper curvy. I wear the curvy in knits and really curvy in wovens, and I am an E cup. I also make my own clothes and have found patterns that cater up to a D cup. In the UK 36D is the average size, so it really makes me wonder why companies don’t produce patterns in cup sizes already. Doing an FBA is a pain! thanks so much for this information. we rarely hear the back piece has to be adjusted also. What happens to the dart that is created? Do you sew it in or eliminate it? How do you eliminate it if you don’t want it? Thanks! Pat, if you don’t want the bust dart, just ignore it. Pretend the dart is not there. Your side seam will be a little longer, which is why you would also need to lengthen the back pieces. If you do want the bust dart, you would sew it as is. In that case, you would not need to lengthen the back. Thank you! It makes perfect sense! Yes, I think it would be very helpful to have a few more body measurements include. As someone suggested above, it would good enough to do that on the website. A high bust measurement usually give a better sense of the size of the body frame overall, because full bust varies so much. Knowing more of those details may make it easier to choose a size and get a sense of adjustments required. PS – I’m still unsure about whether this will work. I don’t entirely understand add length to the back of a garment when the length and width is needed at the bust. I realise you’re trying to true up the side seams without changing the style lines, but still, the FBA should add only to the bust area, right? It seems like adding length to the back would create problems. It certainly would for me, at aleast becuase I usually need to take length and width out of my lower back. What about a princess seam? Perhaps that would allow for bust adjustments without taking away from the style lines of the jacket?